Deia borders the municipal areas of Valldemossa, Bunyola and Soller. The region of Deia is blessed with an abundance of sun, with 8 hours in average in spring, 7 hours in autumn and 6 hours of sun per day in winter. In summer months, you can expect to enjoy 10 hours of sunshine per day. The climate is maritime Mediterranean, with warm hot summers and short mild winters. August is the hottest month in Deia with an average temperature of 26°C, and the coldest is January at 10°C. The wettest month is November when the chances of rain are 39%. The driest months are typically June, July, and August, when the average rain chance is 9.3%. The area is sheltered from the Nordic Tramuntana wind by the mountains of the Sierra de Alfabia range. Especially, it protects the area from the cold and wet sea winds that blow during the winter. In summer, a local wind of the Embat, created by heat rising from the island, is drawing a pleasant cool breeze in from the sea. The thermal variation of the water has a range of around 22 °C in autumn and 23.6 °C in summer. During the winter, it drops down to about 15.6 °C. The highest average sea water temperature is usually in August, September and July. The best month for swimming in the sea is in August when the average sea temperature is 26°C. One of the jewels of the Mediterranean, a municipality of Deia is located on the rugged northwest coast of Mallorca in the steep valley of the Tramuntana mountain range between Valldemossa and Bunyola. It forms a part of a landscape awarded as a World Heritage Site, which makes it the most sought-after and attractive parts of the island. The name Deia comes from the times of the Moorish conquest of Mallorca back between the tenth and thirteenth centuries, as in Arabic the place was called ‘ad daia’, meaning ‘hamlet’. The permanent population of the municipality constitutes some 768 people, where almost half of them are expats. However, this number is always increased by a constant flow of visitors, who come to Deià for its maintained authentic character. The local inhabitants thoroughly combine agriculture, the fine arts and crafts with tourism and an adequate urban development which is controlled taking into account the impressive landscape. Luckily, it is respected and very well preserved by the citizens. The average price for the apartment for sale in Deia is on the same level as in Western Mallorca overall – Average price per sqm. in Western Mallorca €3,906 0% properties#: 128 last change on: 19 Apr 2019 €3,906 per square meter. The average price for a house here is significantly higher and hovers around Average price per sqm. in Western Mallorca €4,175 -1% properties#: 535 last change on: 19 Apr 2019 €4,175 per square meter, while investment opportunities are also available for Average price per sqm. in Western Mallorca €3,887 0% properties#: 33 last change on: 19 Apr 2019 €3,887 per square meter. The most active agencies on Deia real estate market, listings the highest number of properties are Engel & Völkers, Charles Marlow and Vogue. Boasting dramatic scenery of mountains and stunning views out to the sea, the municipality is ideal for a holiday of any type and whatever the season. Especially nature lovers and hikers come here to enjoy the special flair of the Mediterranean and the Tramuntana Mountains with its flora and fauna. There are many attractions and activities that can be carried out in the region such as walking excursions, cycling holidays, countryside retreats, and beach holiday. It is also perfect for a winter sun break because of the mild climate with very few really cold or rainy periods. The region has five kilometres of coastline that includes Sa Foradada, Cala de Deià and the tiny Cala de Llucalcari. These beaches are like a secret hidden paradise, with incredibly clear waters and the mountains as a backdrop. Here you also find important sites, such as Son Marroig, an estate acquired by Archduke Ludwig Salvatore of Austria (1847-1915). There is a museum devoted to the Archduke, but most spectacular are the viewpoints over the coastline that Ludwig had built. Puig del Teix is the municipality’s highest point that boasts magnificent views over the Serra de Tramuntana that you can admire from the place referred to as Serra del Teix. The beauty of Deià and its relaxed and hassle-free way of life attracted many artists, painters and writers, who have been flocking here in search of the quiet and inspiration, starting from the end of the 19th century. A great example is Robert Graves, one of the greatest British poets and writers, who lived in Ca n’Alluny, the house he built, from 1929 until his death in 1985. As a result, despite being one of the smallest and isolated municipalities on the island, it is not surprising that Deià is widely recognized as the cultural centre of Mallorca. As opposite to nightclubs and karaoke bars so popular in the southern resort areas, here you find museums, art galleries and the great artistic heritage. Now, there is a well-established community of artists that gives the village a unique atmosphere. Nevertheless, its low-key sophistication is mixed with the Mallorcan chic, catering for the wealthy individuals that it tends to attract. In Deià, you find a number of fancy boutiques and restaurants, ranging from the Michelin-starred Es Raco D’es Teix to the local bars with live music and jamming sessions. 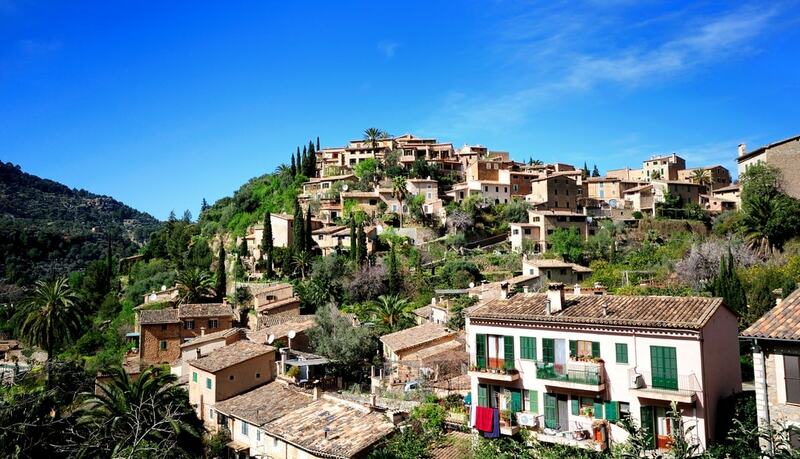 The centre of the municipality is the fabled mountainside village of Deià, notable for its extraordinary beautiful scenery, peace and bohemian vibe. With its picturesque red houses, descending in terraces towards the lovely cove, this once-humble village is now something of a millionaire hideaway. Equally charming is tiny Llucalcari, a coastal village situated a little further on towards the so-called ”Orange Valley”, leading to Sóller. Finally, Deià municipality will admire you greatly with its magnificent setting and preserved individual charm that has made it one of the most enticing destinations of Mallorca and beyond.